Not bad although very much a gastro pub with all that entails. Both service and customers were friendly but (oh dear!) the ale was all from the Mouldy Monarch. I was born locally but surprisingly don't remember this place at all. Did it have a previous name? This is not a pub. Gastro experiments are killing pubs....avoid like the plague unless you are middle class, looking for somewhere to read the Guardian with a coffee. Tragic. 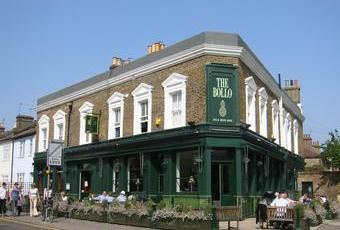 Had a pleasant pint outside in the afternoon sunshine however I would not really describe this place as a pub. I am sure that it used to be but this is really a restaurant with a bar. Not really my cup of tea but gets a half decent score for me due to my enjoyment of the pint. Ghastly service! Popped into the pub last night for dinner. Stood around waiting to be seated in the restaurant only to be ignored by every one of the waitresses. Decided to take a seat, only to wait another 15 minutes to be served. Drinks were ordered, but nothing arrievd for another 10 minutes which were then brought to the wrong table, by this time my patience were running a little thin. We ordered our meal which surprisingly came on time but the burger I ordered was still half raw. Waited another 20 minutes before we could get the attention of one of the waitresses. By this time I'd lost my appetite completely. Although we received an apology, the table next to us ordered burgers as well which were also still raw. All in all the service was shocking and the food sub standard. Defintely a ghastly "Gastro-pub" wannabe. I certainly won't be back!